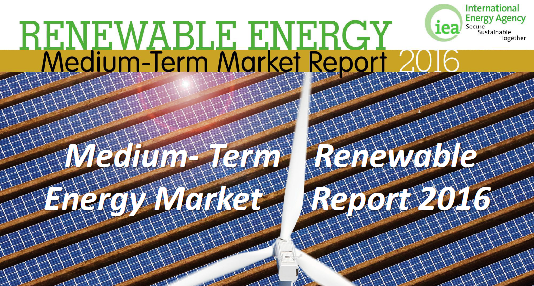 The IEA’s Medium-Term Renewable Energy Market Report or MTRMR 2016 again includes a chapter on renewable heating and cooling – and it’s growing in size. The 282-page document published from Singapore on 25 October analyses on 47 pages the current and future market development of four renewable heating technologies: biomass, solar thermal, geothermal and heat pumps. The IEA began to add a renewable heating chapter to its MTRMR in 2013 – back then, it had only 14 pages. The authors of this year’s edition emphasise the fact that onshore wind and solar PV are the only renewable technologies on track for a 2 °C target. Their wake-up call to policy makers: “Fewer countries have established renewable policies in the heat sector than in the electricity sector.” And: “Renewable heat markets face multiple economic and non-economic barriers that need targeted policy support, particularly in a low fossil fuel price environment.” The IEA analysis indicates that there will be no significant oil price recovery in the immediate future, with the market potentially rebalancing at 80 USD/barrel in 2020 (today’s price is around 53 USD/barrel). The solar heating and cooling section in the latest MTRMR reflects official IEA Energy statistics which is data that the countries send directly to the IEA. The chapter is as well based on the most recent Solar Heat Worldwide study published in May 2016 by Austrian institute AEE INTEC, the REN21’s Renewables 2016 Global Status Report and Euro’ObservER’s 2015. In contrast to these studies, which focus on describing the status quo, the IEA medium-term report forecasts market development over the next five years until 2021. The key predictions for solar thermal are quoted below. Global view: Over the medium term, solar thermal heat consumption is expected to grow by 5 % annually between 2015 and 2021 and reach 2 exajoule (1 EJ ≈ 278 TWh) by 2021, with the biggest gains in China, the United States and Europe. The building sector is forecast to remain the largest consumer, accounting for 97 % of solar end-use heat, though consumption in the industry sector is expected to ramp up and grow by 15 % annually between 2015 and 2021. Europe: Deployment dynamics will likely differ by climatic region. Mediterranean countries with higher insolation levels should continue to find lower-cost thermosiphon systems suitable for applications with low-to-medium-temperature heat demand. However, in colder climates at higher latitudes, solar heating will likely continue to require government support to make systems attractive in comparison to lower-cost heating alternatives. Solar Process Heat: One of the market segments with the largest untapped potential for solar thermal is industrial process heat, particularly in sectors with high hot water demand, such as the textile or food industries. This demand is currently being met by fossil fuels. High-temperature applications in other sectors, such as steam generation for Enhanced Oil Recovery, are also becoming increasingly attractive. Solar thermal process heat is expected to more than double by 2021, with over 60 % of the expected growth in Europe, India, the United States and the Middle East. However, the pace of deployment is limited by high upfront costs associated with customised designs for existing process heat integration and a lack of innovative financing schemes. China: Over the medium term, rising heat demand, growing concerns over air pollution from coal-fired heat, and new targets proposed in the draft version of the 13th Five-Year Plan to double collector capacity by 2020 (to 800 million m2) are seen as drivers for solar thermal deployment, though the pace of growth is expected to be slower than over the previous six years. India: Prospects for further solar process heat are promising, given India’s high reliance on imported diesel for industrial heat demand. Government support of concentrating solar steam generation for community cooking, laundry and cooling should foster further developments, while an industry call for a renewable heating obligation for process heat could stimulate growth if turned into law. The MTRMR reports of 2012 to 2015 are available for download. The most current MTRMR 2016 is only available for sale.